Curious about how zero waste grocery shopping works? Shopping bulk the first time can be intimidating. There’s a lot to figure out, like what containers work best, how to transport the containers, where to store the containers between shopping trips, etc. But learning to shop package-free was probably the lifestyle change that had the biggest impact on reducing my weekly trash. There was a lot of trial and error before I figured out a system that worked for me and the stores I frequent. 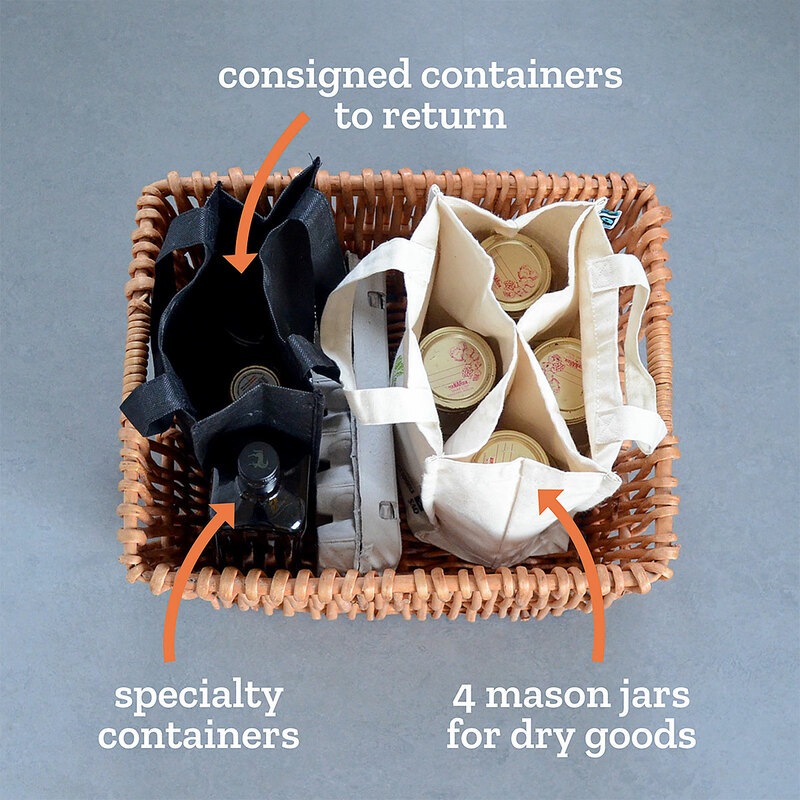 On my first few zero waste shopping trips, I lugged a wicker basket full of glass and plastic containers to the store. Not only was it heavy and awkward, but it was too big to fit in the wheeled baskets provided by the package-free stores. Then I started bringing mason jars in a reusable grocery bag, which solved the weight and fit issues, but then they constantly fell over while I was shopping. As soon as I’d remove one jar, the others would topple over. Ughh. Four 1-liter mason jars: These are a good size for the dry goods I buy. And because the jars are all the same weight, it makes things a lot easier at weigh-in and checkout. If I need a small quantity, I don’t fill the jar all the way. Cotton wine tote bag: This tote bag for four wine bottles from SAQ ($5.95 CAD) fits four 1-liter mason jars perfectly. The dividers prevent my jars from banging into each other or falling over while I’m shopping. Plus, the compact size of the tote bag means that it’s not too awkward to carry even when it’s full. Specialty containers: I leave these in my bulk shopping kit for items that wouldn’t work in a mason jar (like eggs, oils, etc.). When I run out of something, I wash the empty container and set it by my front door. I take it to my trunk the next time I head out. Small tote bag: This holds consigned glass jars or bottles that need to be returned. When I arrive at the store, I bring this tote bag with me, get my deposit back then shop as usual. Now I have an extra bag to use at checkout if needed. Sturdy wicker basket: This basket now has a permanent home in the trunk of my car to keep bulk items from jostling while I’m driving. Produce tote bag (pictured below): This contains my DIY produce bags for buying fruits and vegetables. At the store: I grab the tote bags I need (consigned jars, bulk and/or produce) from my trunk and head inside. If I have containers to return, I do that first. If I’m bulk shopping, I weigh my containers then fill them up. If I’m buying produce, I put package-free fruits and vegetables directly into my cart. If I want to keep items together (like apples), I’ll put them in one of my produce bags. At the checkout, jars and produce get weighed and the container weights subtracted. After paying, I head to my car without a piece of plastic packaging. 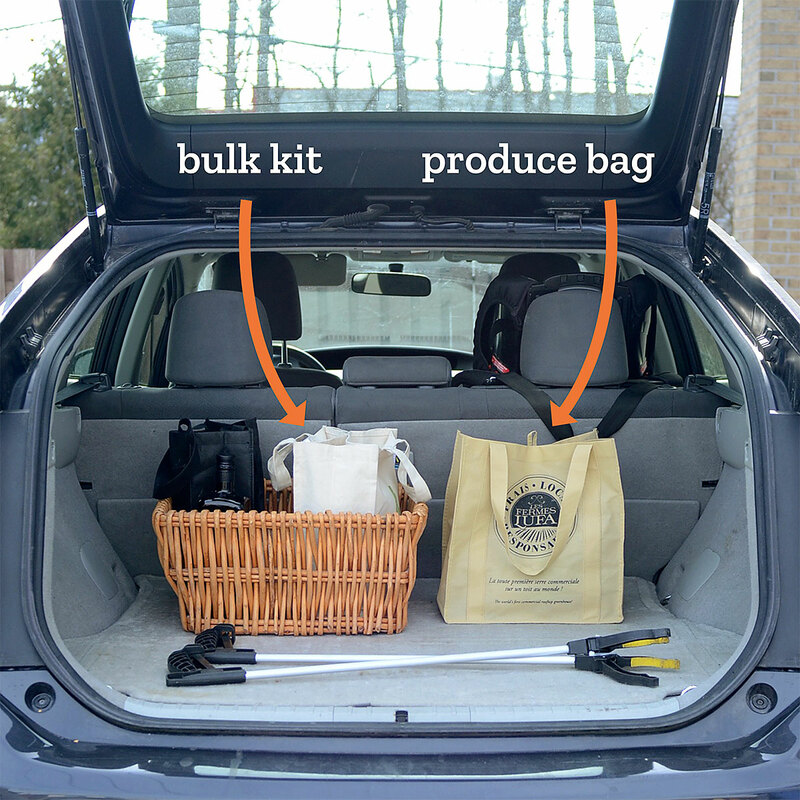 I return my bulk bag to the wicker basket in my trunk, place my produce bag next to it and drive home. At home: I bring my bags into the kitchen and either put the jars directly into my cabinets or pour the contents into existing pantry jars. I grab clean mason jars to refill my tote bag. I empty produce into my fridge and fruit bowls. When everything’s put away, I set my tote bags by the front door so they’re ready to go back in my trunk the next time I head out the door. We have bought many items in bulk for years. I used to put the bulk items in plastic bags and then transfer them to canning jars at home. My wife suggested skipping the plastic bags and filling the canning jars at the store. When I started doing that I printed out labels for the lids of the jars. The labels specify the Tare (empty) weight, Item #, Item (rice, beans, oatmeal, etc.) and approximate net weight. Because the labels are easy to read every time a new cashier sees the jars they thank me and I become their favorite customer. We keep two jars of each item so that when one is emptied it goes in the car for the next shopping trip and we can start using the second jar. By keeping dedicated jars for each item, and having a label with the tare weight on the top, I don’t have to re-weigh them every time for the tare weight. Also, I keep a shopping list on the fridge but if I forget to put a bulk item on the list I can’t forget to refill the jar at the store because it is labeled with the item and in my reusable shopping bags in the car. BTW, I was always forgetting my reusable shopping bags until I decided to keep them in the car. Then, even if for some reason I go into the store without them, I can always run back to the car to get them. One other shopping tip. If I am only going to buy a couple of things I always refuse a bag, especially if I haven’t brought in my reusable shopping bags. My motto is, “If I brought it to the checkout in my hands I can carry it out in my hands”. This is great! Thank you for sharing your tips and tricks! And yes, I, too, keep the reusable bags and containers in the trunk of my car—that way I’m never caught without. I’ve even run out to my car at the end of a meal on a couple occasions when I realized I forgot to put a food storage container in my bag—luckily the car is a short walk away so no need for to-go containers or doggie bags! Very similar here – I don’t use a car every day, so I keep some paper bags and small light boxes in my backpack – just in case I end up in a bulk shop. Nice! 🙂 I also keep a lightweight reusable bag in my backpack/purse that rolls up to a tiny size so I’m never caught off guard.